The number of patients requiring hemodialysis (HD) has been increasing globally because of the rise in the prevalence of end-stage renal disease (ESRD). The arteriovenous fistula (AVF) is the most frequently used method for HD in these patients. The BVT is a time consuming and technically challenging procedure with significant perioperative morbidity due to long incisions and extensive surgical dissection. The conventional BVT requires long incision over the medial aspect of the arm to dissect the basilic vein up to axillary vein. It is then cut in the cubital fossa and transposed into the subcutaneous tissue by multiple small incisions to perform the end to side basilic vein brachial artery anastomosis. In our institute, we use two to three small incisions to dissect the basilic vein and then it is tunneled into the subcutaneous tissue over the fascia. This retrospective study aims to evaluate the patency and complication rates of BVT performed with this small incision technique. This is a retrospective study including all the patients who underwent BVT in our Tertiary Care Institute, between March 2013 and March 2015. The BVT was done in those patients who had either failed previous RCF or BCF or who had small caliber or thrombosed cephalic veins. All patients underwent color Doppler of the upper limb before surgery. The minimum vein diameter of 3 mm was taken up as a cutoff value to undergo this procedure. All the patients underwent one-stage BVT where a 3-cm horizontal incision was made in antecubital fossa to expose the brachial artery and basilic vein. Multiple longitudinal separate second skin incisions (2–3 cm) were made to explore proximal part of basilic vein. The side branches of the vein were isolated and ligated. The basilic vein was divided in antecubital fossa and brought over fascia through the newly created subcutaneous tunnel. The end-to-side anastomosis of basilic vein was done with brachial artery [Figure 1]. All the patients were evaluated for the patency rates and complications for the six months. Figure 1: (a) Basilic vein mobilization up to axilla through dissection with small longitudinal incisions ligated and divided at cubital fossa. (b) Subcutaneous tunneling. (c) After closure (blue line shows course of BV in subcutaneous tunnel). A total of 18 (12 males, mean age 44.2 ± 14 and 6 females, mean age 42.6 ± 12) patients underwent BVT of 2 years at our institute from March 2013 to March 2015. Out of all the patients, 11 (61%) were previously operated on at our institute and the seven (39%) patients with failed AVF surgery were referred at our tertiary care. The characteristics of the patients including mean age, duration of ESRF, number of AVFs, patency duration, comorbidities and diameter of the basilic vein, and brachial artery are shown [Table 1]. The mean operative time for BVT was 185 ± 12 min. The patients were followed for six months. Table 1: Demographics of the patients. The fistula maturation rate was 100%, and the mean postoperative flow rate was 290 ± 22 mL/min [Table 2]. The patency was observed at discharge, at six weeks and six months. There was no primary failure in these patients. The mean maturation time was 42 ± 10 days. Six (33%) patients had arm edema, and three had infections (17%), which were treated with arm elevation and antibiotics. There were five (28%) patients who had lymphorrhea which completely stopped in a month with conservative management, including aspiration and dilute betadine instillation [Figure 2]. No bleeding, thrombosis, failure, pseudoaneurysm, or rupture occurred in our patients. Table 2: The fistula maturation and complications rates. Figure 2: Matured BV in subcutaneous tunnel (red arrow), anastomotic site incision (black arrow), and small longitudinal incisions with lymphorrhea (green arrow). The establishment and maintenance of hemodialysis vascular access for the ESRD patient is a costly modality with significant associated morbidity. AVF surgery to supply extracorporeal blood flow during HD has been performed for many years. According to the National Kidney Foundation’s KDOQI, “radial-cephalic (RC) and brachial-cephalic (BC)” fistulae should be the first and second choices for vascular access, respectively, and in the absence of adequate veins or after failed RC/BC access, a brachial-basilic fistula or arteriovenous graft should be considered. “BVT was first described in 1976 and has been increasingly accepted as a viable option for secondary or tertiary vascular access. Although the peri-operative morbidity associated with BVT is higher, it is increasingly the access procedure of choice when a superficial arm vein is unavailable. The conventional BVT required longer incisions, but with modified technique of two to three small incisions for dissecting the basilic vein and then tunneling it in the subcutaneous plane, the morbidity is minimal in our series. 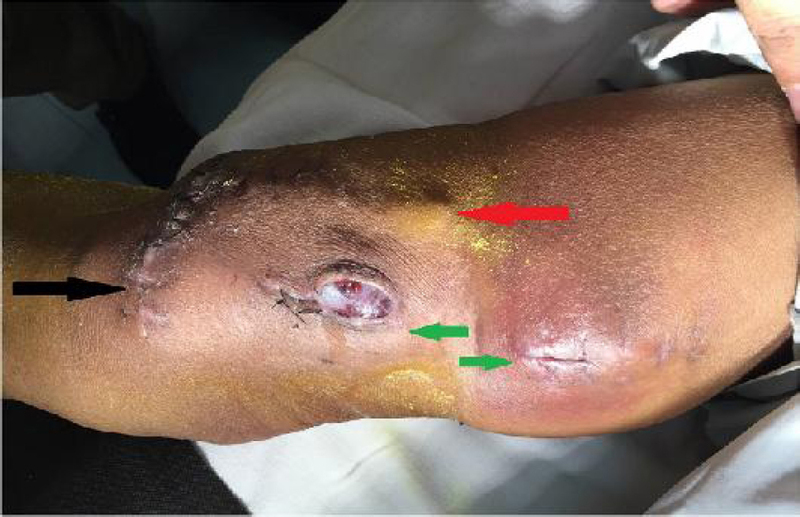 In a single-stage procedure, basilic vein can easily twist during tunneling and cause immediate thrombosis or stenosis in the vein near the axillary and basilic junction (swing point) but no such event encountered in our series during tunneling. Few studies in the literature have compared different techniques for BVT.,, Kakkos et al compared one-stage and modified two-stage BVT and found fistula maturation was 85.5% in Group 1 and 81.6% in Group 2. They concluded that there was no significant difference between the groups. In this study, all the patients underwent single-stage BVT with better fistula maturation rate. Reported complication rate for BVT remains high (between 47% and 71%) when long incisions were used to dissect the vein, but this can be reduced with technique of transposition. The complications in this study were lymphorrhea in 28%, infection in 17%, edema in 33%, and hematoma in 6% which probably were due to the excess dissection but all were managed conservatively. Early postoperative acute arm swelling is a combination of the larger dissection, coupled with the higher venous flow seen after BVT. The edema may hamper successful needling of the AV fistula. The lymphorrhea resulting from lymphedema due to extensive dissection was managed with arm elevation. Few of the patients required intermittent aspiration and dilute betadine instillation. The postoperative wound infections occurred mostly in diabetic patient but were successfully treated with daily dressings. Almost all the patients had resolved edema and lymphorrhea by the time of maturation of fistula. Thus, early complications do not seem to have any impact on fistula outcome. There was no thrombosis, failure, rupture, or pseudoaneurysms that occurred in our patients. The main limitations of the study are the retrospective design, short follow-up time and the mean diameter of the basilic vein that underwent BVT was predetermined. It is well known that many factors influence fistula maturation,,, but in terms of improving fistula outcome and technical success rates, the preoperative assessment of basilic vein quality and caliber using duplex ultrasound has been increasingly advocated. In our experience, the BVT is technically feasible and having excellent fistula patency. It is the most durable HD access procedure for those patients having multiple forearm AVF surgeries. With small incisions for exteriorization and followed by subcutaneous tunneling of the basilic vein, the operative complications are minimal. Quinton W, Dillard D, Scribner BH. Cannulation of blood vessels for prolonged hemodialysis. Trans Am Soc Artif Intern Organs 1960;6:104-13. Foundation NK. KDOQI clinical practice guidelines and clinical practice recommendations for 2006 updates: Hemodialysis adequacy, peritoneal dialysis adequacy and vascular access. Am J Kidney Dis 2006;48 Suppl 1:1-322. NKF-K/DOQI clinical practice guidelines for vascular access: Update 2000. Am J Kidney Dis 2001;37 1 Suppl 1:S137-81. Oliver MJ, McCann RL, Indridason OS, Butterly DW, Schwab SJ. Comparison of transposed brachiobasilic fistulas to upper arm grafts and brachiocephalic fistulas. Kidney Int 2001;60:1532-9. Hakim RM, Himmelfarb J. Hemodialysis access failure: A call to action – Revisited. Kidney Int 2009;76:1040-8. Gelabert HA, Freischlag JA. Hemodialysis access. In: Rutherford RB, ed. Vascular Surgery. Philadelphia: WB Saunders; 2000. p. 1466-77. El Mallah S. Staged basilic vein transposition for dialysis angioaccess. Int Angiol 1998;17: 65-8. Sidawy AN, Gray R, Besarab A, et al. Recommended standards for reports dealing with arteriovenous hemodialysis accesses. J Vasc Surg 2002;35:603-10. Hossny A. Brachiobasilic arteriovenous fistula: Different surgical techniques and their effects on fistula patency and dialysis-related complications. J Vasc Surg 2003;37:821-6. Kakkos SK, Haddad GK, Weaver MR, Haddad RK, Scully MM. Basilic vein transposition: What is the optimal technique? Eur J Vasc Endovasc Surg 2010;39:612-9. Taghizadeh A, Dasgupta P, Khan MS, Taylor J, Koffman G. Long-term outcomes of brachiobasilic transposition fistula for haemodialysis. Eur J Vasc Endovasc Surg 2003; 26:670-2. Hatjibaloglou A, Grekas D, Saratzis N, et al. Transposed basilic vein-brachial arteriovenous fistula: An alternative vascular access for hemodialysis. Artif Organs 1992;16:623-5. Rao RK, Azin GD, Hood DB, et al. Basilic vein transposition fistula: A good option for maintaining hemodialysis access site options? J Vasc Surg 2004;39:1043-7. Patel ST, Hughes J, Mills JL Sr. Failure of arteriovenous fistula maturation: An unintended consequence of exceeding dialysis outcome quality Initiative guidelines for hemodialysis access. J Vasc Surg 2003;38:439-45. Berman SS, Gentile AT. Impact of secondary procedures in autogenous arteriovenous fistula maturation and maintenance. J Vasc Surg 2001;34:866-71. Woo K, Farber A, Doros G, Killeen K, Kohanzadeh S. Evaluation of the efficacy of the transposed upper arm arteriovenous fistula: A single institutional review of 190 basilic and cephalic vein transposition procedures. J Vasc Surg 2007;46:94-9.